When entering a Tibetan Buddhist monastery for the first time, it is very easy to feel overwhelmed by the incredible variety of Buddhas, bodhisattvas and deities – some angry, some peaceful, and all almost always very colorful. But who is who and how can we distinguish the individual personalities from each other? There are usually some very clear attributes, symbols and colors that help identify the Buddha or deity in front of us. 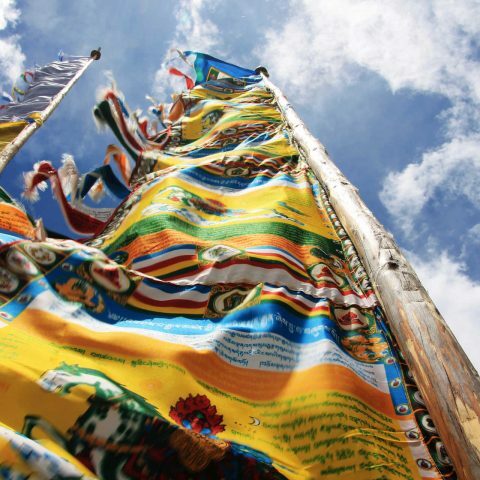 We’ll tell you here how to recognize the 10 most significant figures of Tibetan Buddhism. We have made a selection of Tibetan Buddhism figures which can be found in almost all Tibetan Buddhist monasteries and temples, no matter if in Tibet, Ladakh, Sikkim, Bhutan or Nepal. 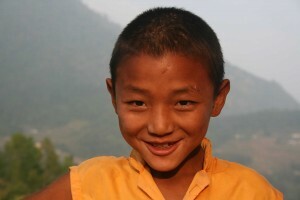 Some play a greater role in a specific school of Tibetan Buddhism, while others share a similar importance in all schools. They all have in common, though, that they are relatively easy to identify. Who is this? Buddha Shakyamuni is the historical Buddha, who lived around 600 BC and is considered the founder of the Buddhist religion. Who is this? Buddha Maitreya is the future Buddha. In Buddhism there are 5 “earthly” Buddhas, each associated with one of the 5 ages (Kala) of the world. Buddha Shakyamuni is the earthly Buddha of the fourth and present age. 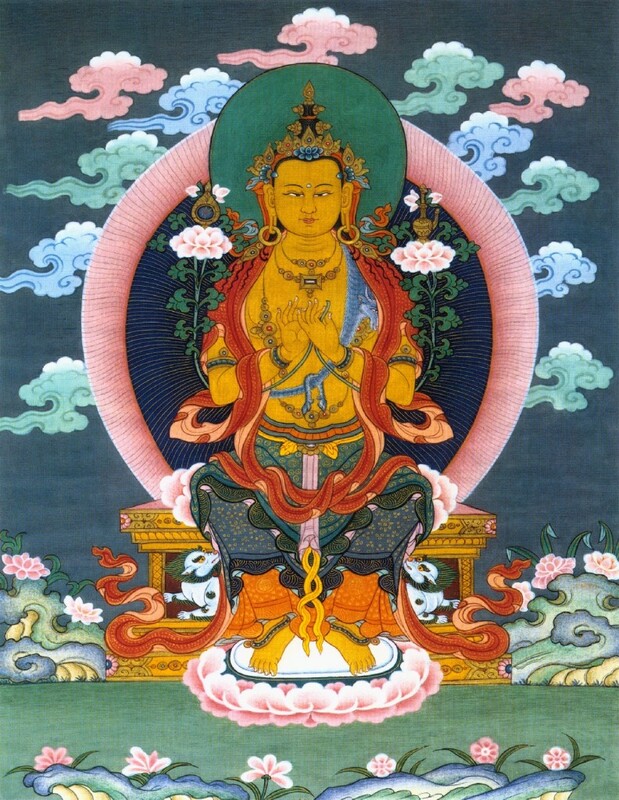 Buddha Maitreya is the final earthly Buddha, expected to appear during the 5th Kala. In his function as great teacher of mankind, he will supposedly lead humanity back to Buddhism. How can I tell? Maitreya is easy recognizable by his posture from – he sits in “European posture”, with both feet on the ground. From this position one can quickly stand up and rise – a symbol of what is to come. In some occasions he is also represented standing up, waiting his time. Additionally, he usually wears a crown and is entwined with flowers. The associated mudra (hand gesture) is the Dharmacakra – the gesture which stands for the turning of the wheel of knowledge (in Buddhism, the wheel is also a symbol for teaching). Who is this? Avalokiteshavara (Tibetan: Chenrezig) is the Bodhisattva of Compassion and patron saint of Tibet. Bodhisattvas are enlightened beings who out of compassion don’t go into Nirvana, but instead stay back and help others to find salvation. The Dalai Lama is regarded as a manifestation of Avalokithesvara. How can I tell? There are 108 (this is a sacred number in Tibetan Buddhism) different manifestations of Avalokiteshvara. However, the most common mode of representation is the shown above, with 11 heads and 1000 arms. On the palms of each of the 1000 hands you can see the eye of compassion. Its main distinguishing feature is Amitabha Buddha, pictured in his crown or as the last face at the top of the highest of his 11 heads. Who is this? 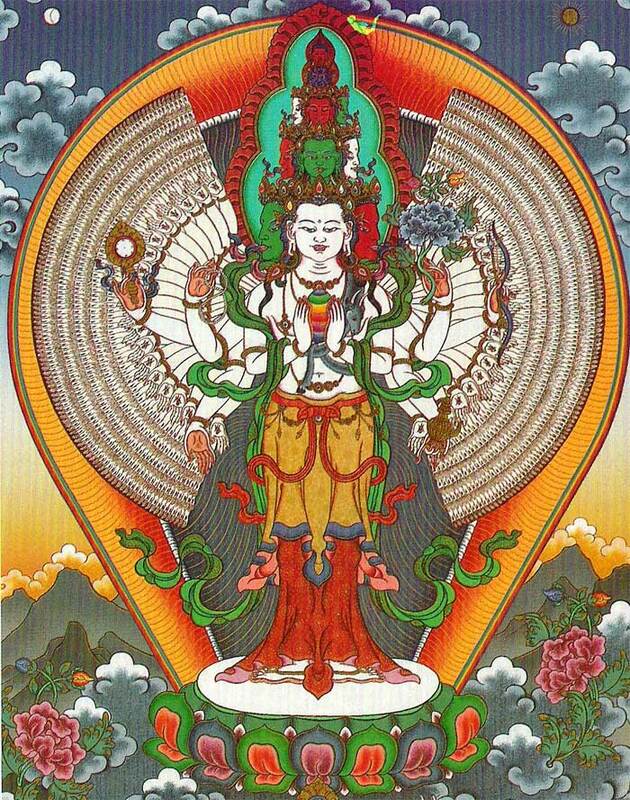 Manjushri is the bodhisattva of wisdom and literature. As expected then, he holds great significance for scholars and students, who call and pray to him requesting gifts of knowledge and memory. How to recognize him? The Bodhisattva is very easy to recognize thanks to his sword. The sword is a symbol of wisdom: with it, the ties of ignorance are cut. Another important symbol is the book by his side, resting on a lotus flower. Who is this? 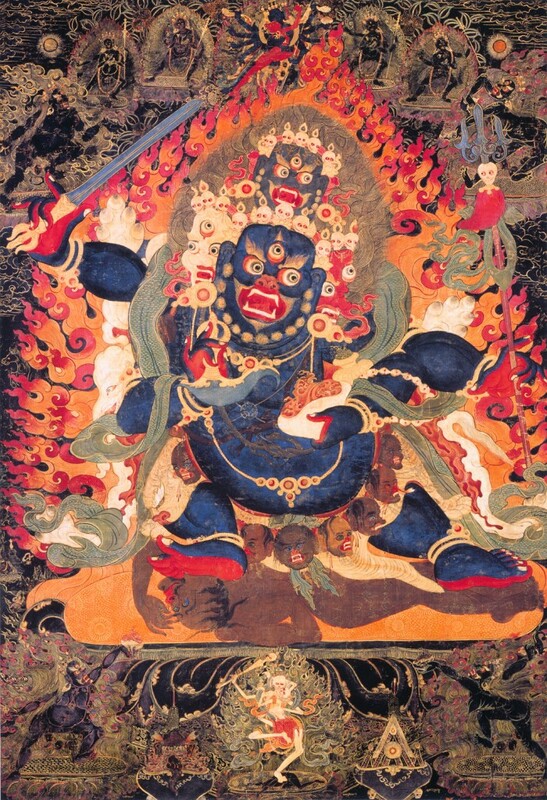 Mahakala is among the Dharmapalas or “Defenders of the doctrine”. 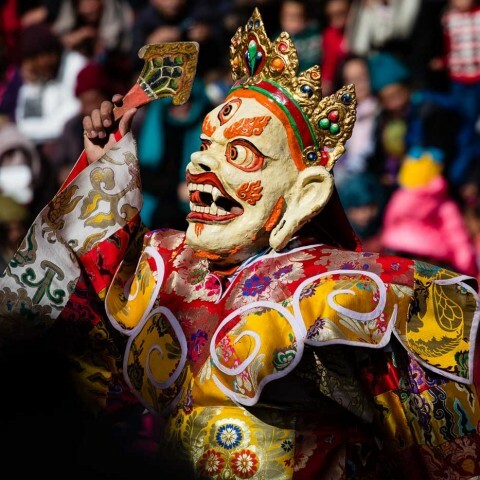 These are actually ghosts, demons and deities belonging to the old Tibetan tradition that have been converted or adapted from Padmasambhava (see below) to Buddhism. You can recognize them by their wrathful representations. Mahakala tantamounts to the Hindu deity Shiva. How can you tell? 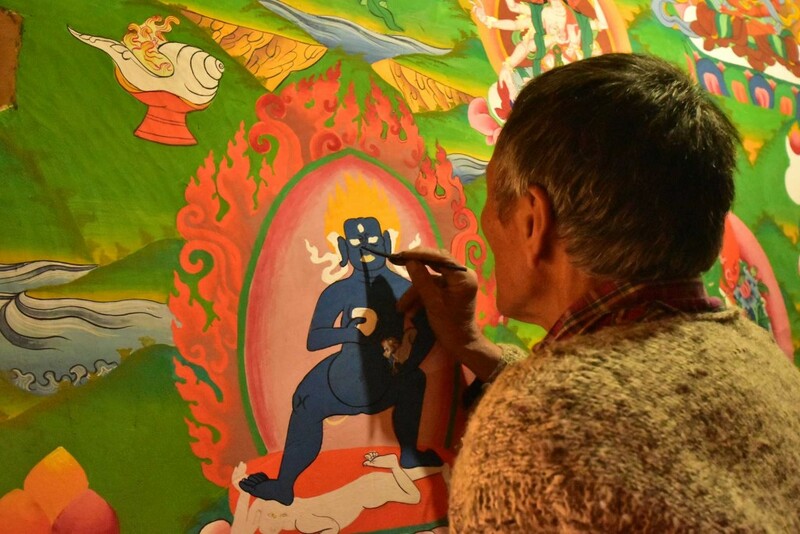 Well, this is not always easy, since there are 75 different manifestations of Mahakala. He is, however, usually standing up. In the front left hand he holds a skull cup and in the right one the Vajra cleaver, with which he cuts through all the negative, materialistic attitudes. In the two back hands he carries a tricorn and a goad. He wears a tiger skin and a belt made of heads, and stands on two outstretched smaller versions of himself. Mahakala has three eyes and carries a 5-skull crown that represents the transformation of the mental poisons of hatred, greed, pride, envy and ignorance. These gruesome attributes symbolize his tireless determination to redeem himself. Who is this? 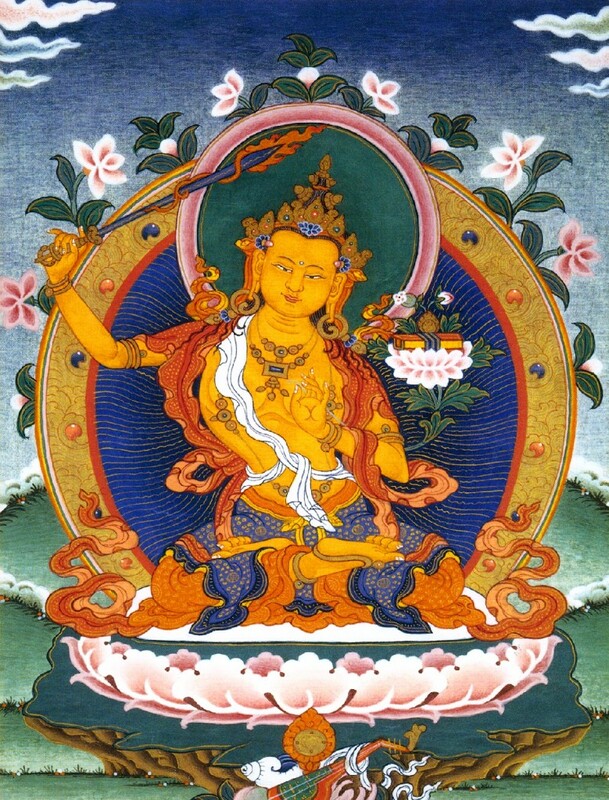 Tara (Tibetan: Dolma) is a female Bodhisattva. There are five variations of her: green, white, blue, red and yellow. She is considered a great protector that guards people against the eight major dangers in life: pride, delusion, anger, jealousy, wrong views, greed, desire and doubt. How do you recognize her? The Taras differ primarily by their different foot placement. 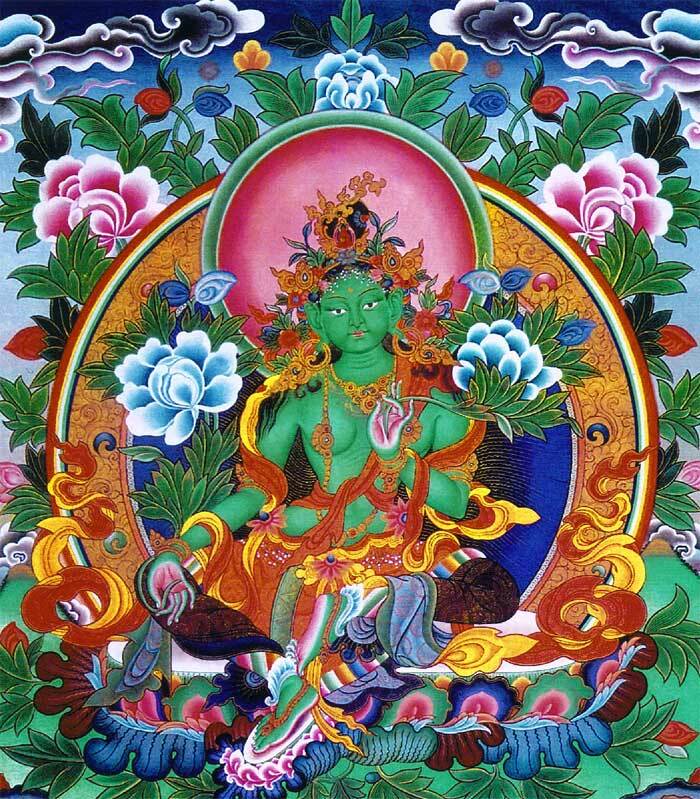 For example, while the white Tara sits in meditation posture, the green Tara’s right foot rests on a small lotus flower. 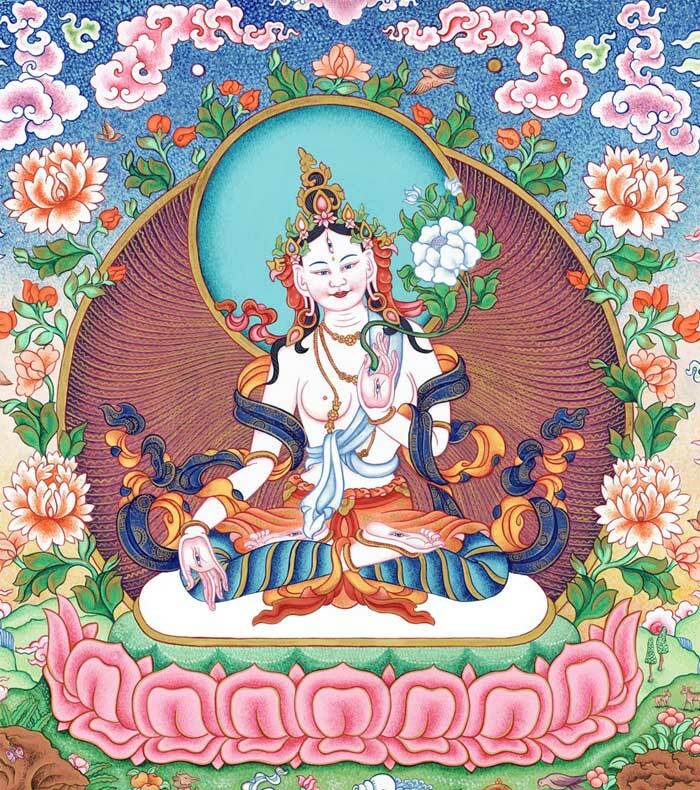 Also, in the white Tara, we can see the open eye of compassion on her forehead, her palms and her soles. Another symbols that we can find are the full-blown white lotus (representing the day) or the blue closed lotus (representing the night). The hands, both with their palms outwards, point in opposite directions: the right one down (a giving, conceding gesture), and the left one up (a gesture that grants protection). Who is this? 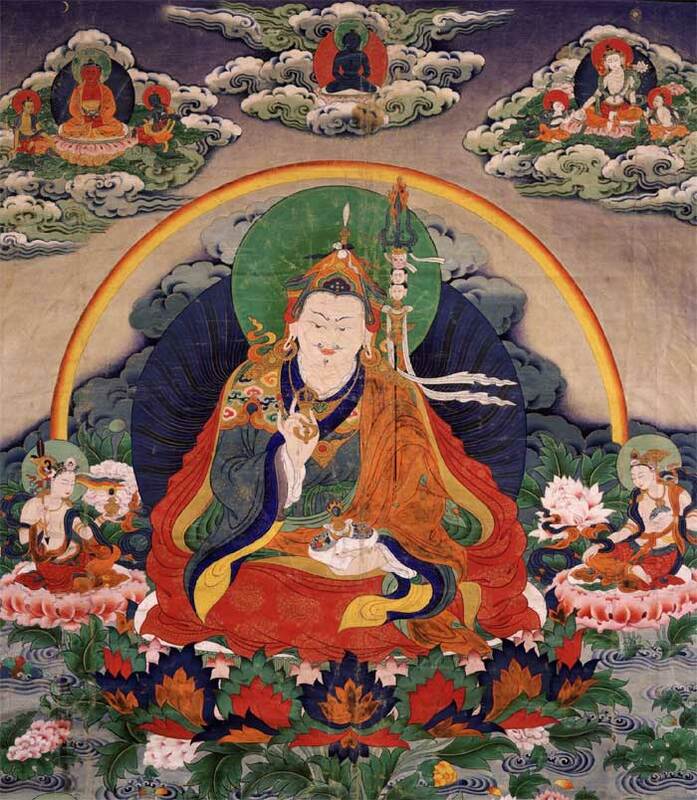 Padmasambhava (the lotus born), also called Guru Rinpoche, is the historically tangible founder of Tibetan Buddhism. 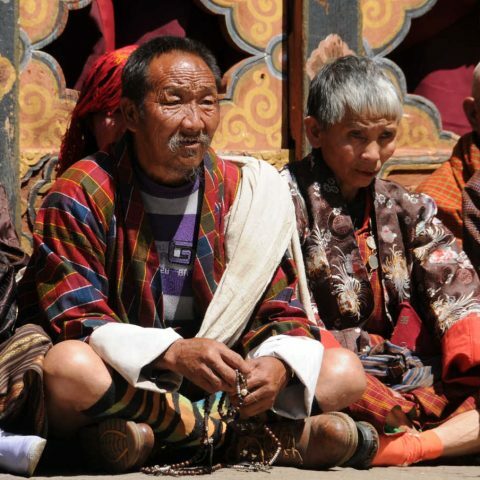 He is considered the founder of the oldest school of Tibetan Buddhism, the Nyingma school, but is nevertheless of great importance for all the other schools too. How do you recognize him? There are eight different forms, the most common of them being fairly easy to recognize: he is depicted sitting with a special hat with upturned ear flaps and a spring at the top. As hardly anyone else in Tibetan iconography, Guru Rinpoche is pictured with a beard. In his left hand he holds a blood-filled skull-cup and in the right the Vajra (Sanskrit: thunderbolt and/or diamond). With his left elbow he holds a magic wand, which tip is usually a flaming trident. Who is this? Palden Lhamo is an old Tibetan female guardian deity. She is the only female deity of the 8 Dharmapalas. 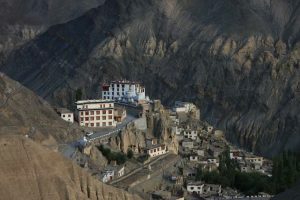 She is worshiped in particular by the yellow hat monks of the Gelugpa school of Tibetan Buddhism, and is considered the patron saint of Lhasa and the Dalai Lama. 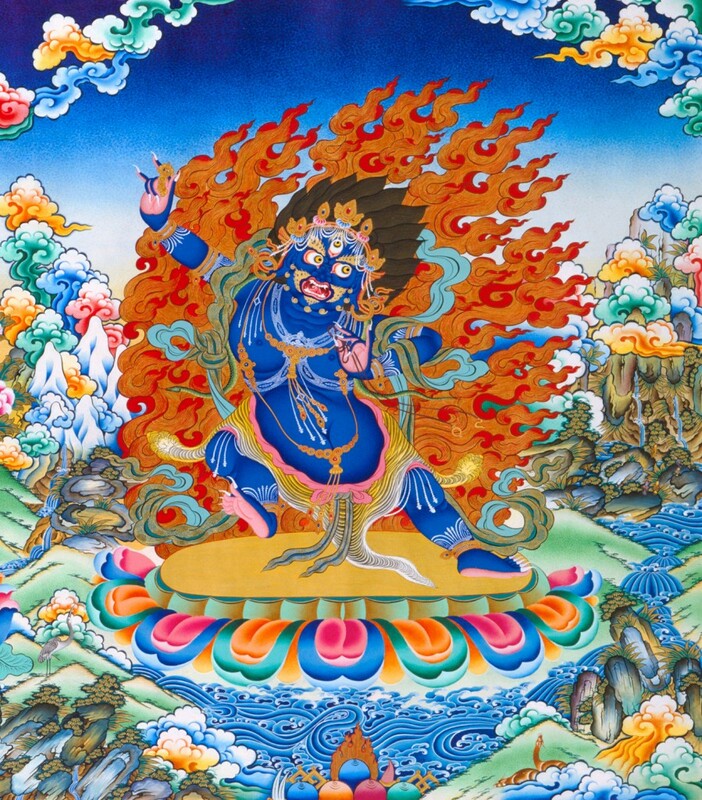 She is the wrathful manifestation of Tara. How can you tell? Palden Lhamo is pictured riding on a mule through a sea of blood. She is black and blue, with sagging breasts, flaming eyebrows and a mustache (not very feminine J). In her hand she carries a cup made of her child’s skull, who was the product of an incestuous act. She is also surrounded by the loops of a string made with 15 severed heads. In her navel we can see a bright sun disc. Who is this? 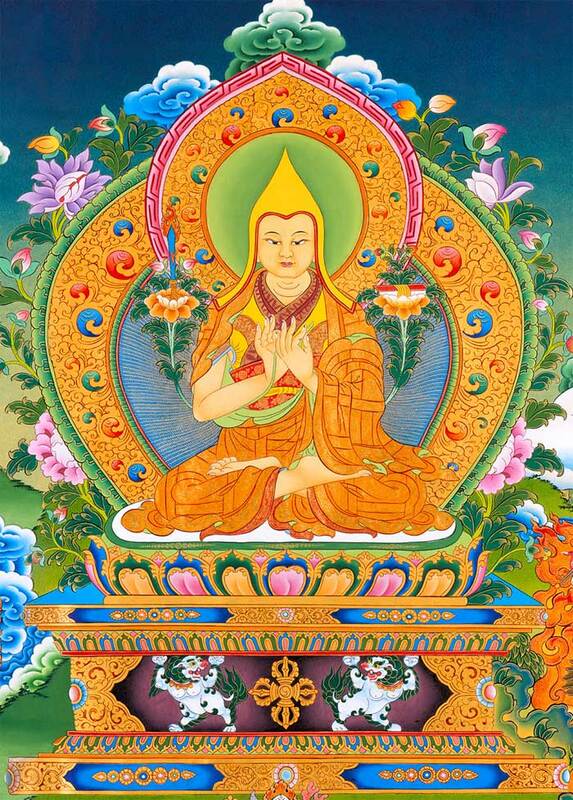 Tsongkhapa is also a documented historical figure. 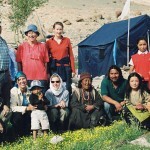 He is the founder of the last of the four main schools of Tibetan Buddhism: Gelug. How can you tell? 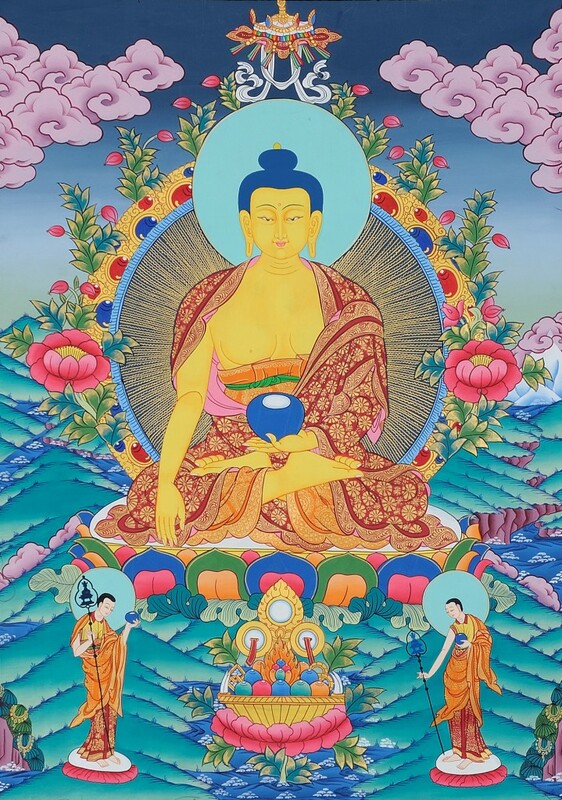 Tsongkhapa is very easy to recognize – he wears the yellow hat reserved for the Gelugpa, his hands make the gesture of Dharmacakra-Mudra (The Turning Wheel of Doctrine), and on his right and left sides we can find, respectively, the sword (a symbol of wisdom) and the book, supported by two lotus flowers. Who is this? Vajrapani is the Bodhisattva of power, one of the three main protective deities surrounding the Buddha, and is often represented in conjunction with the other two: Avalokiteshvara (compassion) and Manjushri (wisdom). How can you tell? 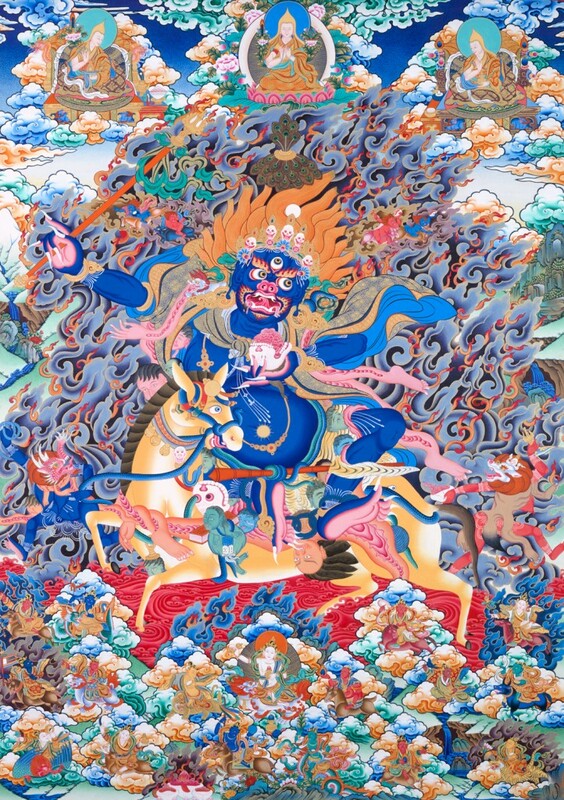 Vajrapani is usually depicted as a wrathful Dharmapala. He wears a crown and a tiger skin, and has a lasso in his left hand with which he captures and ties the adversaries of Buddhism. 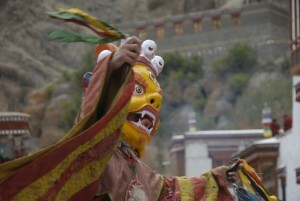 In his right hand he carries the Vajra (Tibetan: Dorje). His figure is surrounded by flames.